The Lean transformation model is a simple, but profound guide to starting and carrying out a change initiative. It doesn’t ask you to follow strict rules or practices and leaves room for thinking and experimentation. 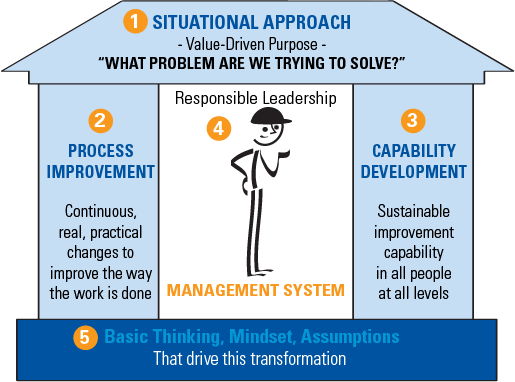 The Lean transformation model is a simple, but profound guide to starting and carrying out a change initiative. It is easy to remember and even easier to teach, especially to people with no prior Lean experience. 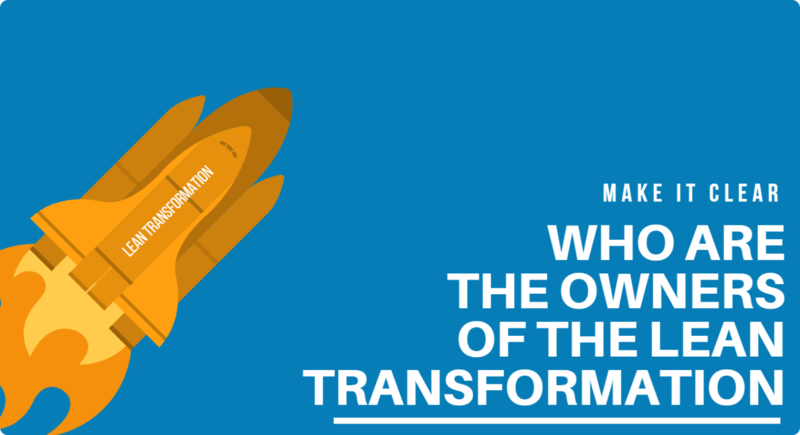 Given the fact that 70% of all transformation programs fail, it is crucial to have a clear understanding about the potential risks when embarking on a journey like this. Maybe that’s why the Lean Enterprise Institute (LEI) came up with the Lean Transformation Model (also called Lean Transformation Framework). They provide the structure that’s required, as a bare minimum, to start with such an ambitious endeavor. At the same time, this model is not prescriptive. It doesn’t ask you to follow strict rules or practices. It leaves room for thinking and experimentation, which is a true gem, especially when comparing it to all the heavyweight frameworks out there. The model is tool-agnostic, but it is compatible with all the popular Lean Management tools such as Kanban, PDCA, A3, Portfolio Kanban and others. First of all, it is important to note that Lean is not a reserved territory for manufacturing or production companies. Lean is a way of seeing the world, which is applicable in virtually any industry. After the introduction of Kanban for knowledge work, the Lean way of thinking has been on the rise for software, product development, marketing, operations and many other teams. Lean started at Toyota, but it has outgrown it, making the Lean transformation model relevant for everyone. What basic thinking, mindset, or assumptions comprise the existing culture, and are driving this transformation? The idea is as simple as it is profound. If you can answer these questions, then you could potentially be successful with your Lean transformation initiative. Of course, there is much more to it than this, but if you cannot answer even one of the questions, don’t attempt changing your organization yet. If you prematurely jump into a transformation program, without the necessary groundwork, you risk underinvesting in some of the dimensions. This will push your program out of balance, which will ultimately lead to failure. The very beginning of the transformation program is the most difficult part. When you have something that big and challenging, it’s usually very hard to even figure out where to start. Throughout the rest of this article, we will provide practical guidance on how to approach answering the important questions from the previous section. 1. What problem are we trying to solve? Whatever the real pain points might be, they need to be documented and presented to all interested parties during the rollout. To make sure all employees and leaders know what the real goals of the transformation are, maintain a living document or a wiki page with all the details. Another caveat to watch out for is having too many goals and too many problems to solve at the same time. The fewer the better. It’s much easier to get the message through if you only want to improve quality. Compare that to improving quality, decreasing delivery times, increasing profit and making your customer happy. It’s just not going to work. Make it very explicit who the owners of the lean transformation are. You will obviously need to have an approval from the board, but who on the board is the sponsor? Is it you? Is it your boss? Who is going to “buy more time” when things don’t go according to plan (they will). Is that person “owning” the problems you’re trying to solve? Do they really care if this particular challenge gets solved? If nobody is willing to stand with their name behind the Lean transformation, chances of success dramatically go down. If we should sum it all with a single word, it should be transparency. The more information people have the greater their support might be. Create as much transparency into the goals and invite everyone to participate to the best of their abilities. You might actually be surprised by the input you get from some of the people. What if some of the challenges could be tackled in a much simpler manner, but nobody thought of it? Not very likely, but possible. Last but not least, don’t think of this as a one-off step. This is a living dimension of the transformation and has to be checked regularly. You need to constantly ask yourselves whether the problem you started solving is still worth solving. You have to be agile and be able to change course, should the situation requires it. 2. How are we improving the actual work? Answering this question should provide the list of process improvements to be made. Be warned though – this should not be a specification telling everyone how to improve their process, but rather a general outline of the processes that have to be improved. In other words, the concrete process improvements being implemented have to support the larger goal. Improving things for the sake of improving is not what you should be after. The criteria for success should also be listed, as the people doing the real work need to know what is acceptable and what not. As shown on the image in the beginning of the article, process improvement is one of the pillars of the Lean transformation model. It supports the roof, which represents the problem being solved. In other words, the concrete process improvements being implemented have to support the larger goal. Improving things for the sake of improving is not what you should be after. Process improvement is all about running small experiments, benchmarking the results and adapting based on the results. 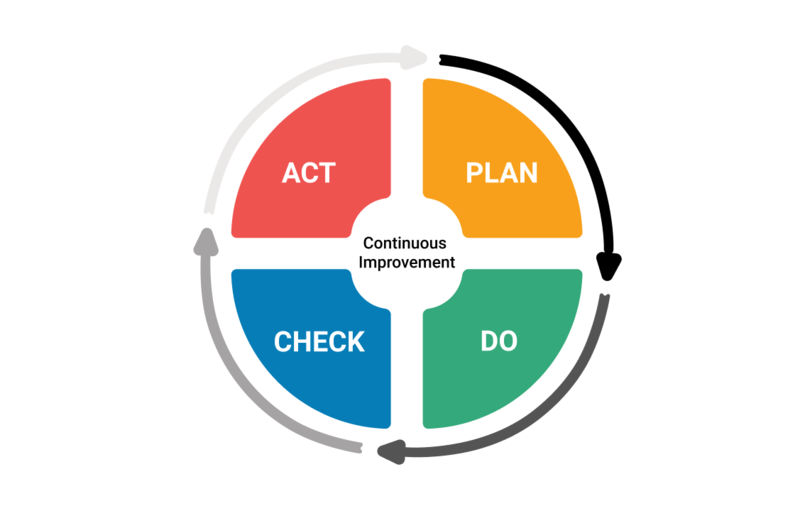 In its root, this is nothing else but Deming’s cycle “Plan Do Check Act” (PDCA). This goes hand in hand with a lot of the Lean startup theory. Build an MVP of a process improvement, validate it with real customers (or colleagues) and if successful, scale it. This is probably going to be the single most difficult thing to achieve – transforming everyone’s thinking into an experimentation mindset. Experimenting requires higher levels of energy and people won’t naturally do it. This requires a real cultural shift, but we’ll talk about this later. That said, be suspicious of recommendations to adopt one framework or the other at this point in time. Many consulting companies will be happy to sell you millions worth of training in order to introduce you to SAFe, LeSS, DAD, Nexus and the like. Don’t do this, unless you are ready to accept the fact that your company won’t be Lean any time soon and you are willing to take a shortcut, just to get some improvement. If you are among the few who realize that shortcuts never work, then you’ll be much better off starting small and starting where you are. This is where all the Lean management tools will come quite handy. Kanban, A3, PDCA, 5 Whys, Poke Yoke, Hoshin Kanri will all get you one step closer to the desired future state. When a significant part of the company has mastered several of the Lean management tools, it’s time to start thinking bigger. Scaling the Lean principles and practices is hard and requires absolute dedication. A great tool to help you scaling Lean across the company is Portfolio Kanban. 3. How are we building capability? Building capability is another way of saying “developing people”. All work gets done by people and this is something to remember. The second pillar of the Lean transformation house is developing people, because we won’t be able to improve our organization, unless we help our people improve. Even more important, it’s the people who have to run numerous experiments and continuously improve the processes all the time. There’s a really nice saying – “If all you ever do is what you ever did, then all you’ll ever have is what you’ve already had”. This is particularly true when it comes to Lean. If your people have not been trained to think Lean, no matter what you try – your company won’t get Lean by itself. It’s way too common for employees to get all the necessary training, while their managers don’t. This creates a communication vacuum and results are suboptimal. 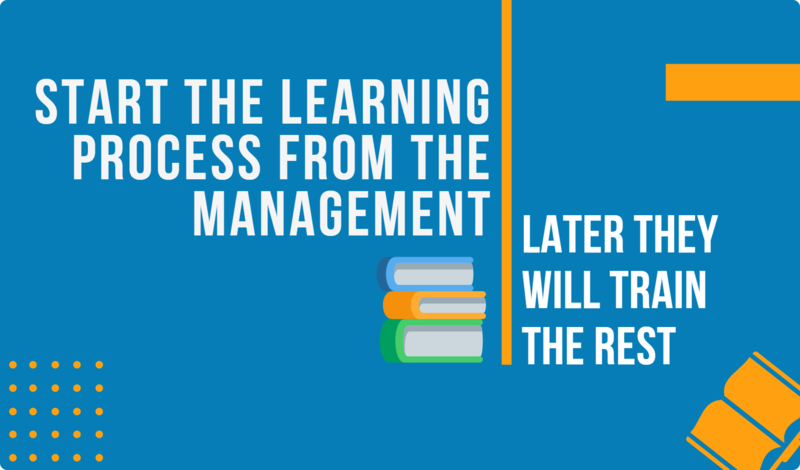 Do this the other way around – start the learning process from the management and only then go to employees. As a matter of fact, the best results would be achieved when all the managers train their own people. This is how Toyota did it and continue to do it. It’s the managers who train their people and not a third-party company that has no real experience inside the business. This builds a special master-apprentice relationship between the manager and the employee and contributes to the long-term commitment of the people to the company. To tackle this dimension of the Lean transformation, make people development a strategic item that the board actually looks into. There’s no single company that will tell you that people development is not a priority, but not too many of them actually have this on the key company initiatives list. The better you become at generating, sharing and reusing knowledge, the faster your company will develop. 4. What leadership behaviors and management systems are required to support this new way of working? There’s no doubt that leadership plays a central role implementing a Lean transformation. That’s why it occupies the internals of the Lean Transformation house (image 1). It interacts with the entire system, in order to make it better, and in return, the system protects it from the cold outside. In a Lean company, everyone should be a leader. As mentioned above, in order to be Lean, a company has to foster rapid experimentation and adaptation to changing environmental factors. This cannot happen effectively in situations where the prevailing leadership style is authoritarian. In the real world, there are no heroes that save the day. It’s the consistency and the perseverance of everyone that matter. If just a few people are pulling the rope, the competition wins. If everyone should be a leader, then what does it take to become one? It’s as simple as learning. Just learn as fast as you can and others will follow you. Leading by example is the single most important characteristic of a leader. Leaders in a Lean organization have to be data-driven. They must not be victims of their egos and have to accept failure. If they force their opinion onto others, without data to back their choice, they won’t fit an ever-changing culture of continuous improvement. When it comes to formal leaders, the ones we call managers, their best capability should be building capability. As our CEO at Kanbanize says “My goal as a leader is to become unnecessary”. As continuous improvement is a journey and not a destination, becoming unnecessary in a truly Lean company is close to impossible and our CEO knows it. After all, the more experienced a Lean thinker is, the more can they help with coaching and mentoring the upcoming generation. But the hidden message is that a leader should help their teams become independent and self-organized. A true Lean leader should teach their people to think analytically and put opinions to criticism. They should make it clear that wishful thinking is pure waste and that governing an organization is only possible through the diligent tracking and active management of key performance indicators (KPIs). Above all, the leader in a Lean organization must be the culture compass. They should be the one that everyone looks up to and tries to copy. The true leader creates the culture of the company and has the guts to change it, if necessary. 5. What basic thinking and mindset are driving this transformation? Speaking of culture, we come to the most important and most critical part of the Lean transformation model. It’s framed as “basic thinking”, “mindset” and “set of assumptions” but this all means one thing – culture. Culture is the single most important asset of a company. If a company is attempting a Lean transformation without the readiness to change its culture, there’s no point even trying. It is sooner or later going to fail. That is why such an initiative MUST start with a blunt assessment of the existing culture and all the challenges related to culture. After the assessment is done, the desired future state has to be identified. A practical vehicle to carry these changes is what we call “company values”. The corporate values represent the company culture and changing the values should eventually lead to changing the whole culture. Of course, this won’t happen with new posters on the wall or yet another powerpoint presentation. Changing values must start from the leadership and has to be demonstrated through real change in behavior. If leaders persistently demonstrate new behaviors, the people will follow. It may take a year, or even more, but they will follow. When you have the vision in place, get the senior leadership to commit to it. There’s nothing more demotivating than going a hundred extra miles, only to be cut off by the executives. If they don’t commit to it and if they cannot be conductors of the culture that the company wants to get to, the journey will be possible, but tough. Each great journey starts with a first step. You’ve just taken it, congratulations! To get yourself prepared even better, keep reading. Just hit the button below, it will take you to the next article dedicated to the topic.